Deadline to Register : June 26th 2016. Schedule will be published on Wed July 4th at the latest. If you are an individual and do not have a team but you are interested in playing then email sportschair.foicr@gmail.com we will try to put you into a team. Hard Tennis Ball will be used for the tournament. $110.00 Entry fee per team or 10$ per individual need to be paid before playing this tournament. No LBWs. No Free hits. 12 overs per innings. 3 overs maximum per bowler. All the teams are expected to be at the ground 20 minutes prior to the match time. There is every chance that the previous match will end early in such case the next match may starts early. As a penalty, team arriving late may have overs reduced from their batting innings. Balls will be provided. Ground will be set up with Boundaries and Stumps. Kindly arrange bats for your team. The trophies in the picture are rolling trophies and will need to be handed back to the organizers by 1st August 2016. Man of the match, Best Batsman, Best Bowler, Best Fielder & Man of the Series will be awarded with individual trophies. Finals team members will be presented with individual medals. In case of any dispute the decision of the FOICR EC will be final. Tournament Start Date: June 25th, 2016. Tournament End Date: July 31st, 2016. Event Fee: $5.00 for members and $10.00 for non-member. 8 Team go head to head to win the FOICR Cricket Tournament. Every year FOICR Indoor games grow more and more popular. This year we are bringing you another edition of this popular event. Apart from indoor games we are adding Rangoli contest to the list of events. This is open for all, team or individual event. We will provide all the necessary colors to express your imagination. FOICR Volleyball Tournament 2015 was conducted on Jan 10, 2015. 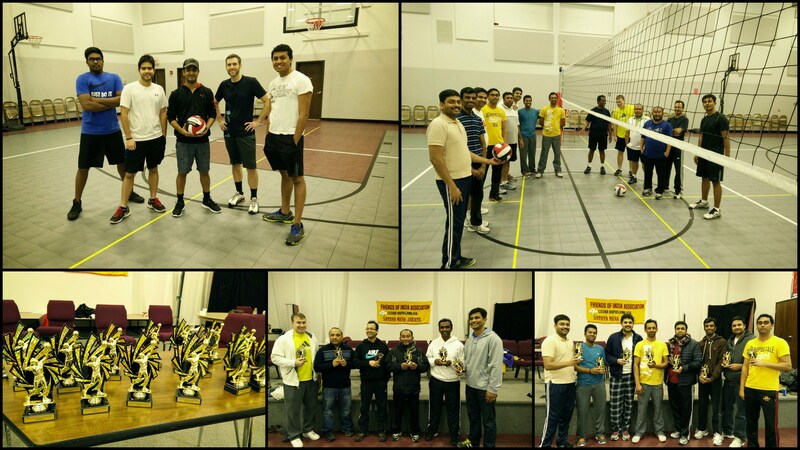 8 teams participated, Sagarmatha won the tournament and Coralville strikers were the runner-up.